Was 2016 named the "European Year to End Violence Against Women"? It has become an Eworx tradition to combine our Christmas and New Year's wishes to you with the "European Year" institution. The European Union selects an important cause each year and puts forward policies and launches initiatives to raise awareness and promote it across the Member States and the world. But was 2016 different? We've seen initiatives from political parties and civil society to promote and name 2016 as the European Year to End Violence Against Women but we're not sure what happened at the end. Nevertheless, it's a good cause and, during 2015, we've been fortunate to work on two major initiatives that promoted it, namely the EIGE's White Ribbon Campaign and the FRA's Violence Against Women Survey. As you may see from these two projects, however progressive European societies may think they are, the problem persists and we need to work harder to eliminate it. We need to look after the safety and well-being of the women of our societies and, if possible, influence non-European societies where women are still not treated equally. 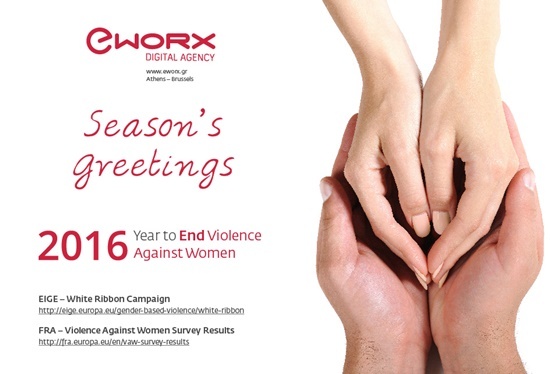 From all of us at Eworx, a big thank-you for a creative and productive 2015. Help us spread the message and have a great New Year 2016!